One of the busiest services in the region, Sourton Cross has a familiar service area next to a picnic area and transport café. The Former Little Chef at Sourton Cross. The history of Sourton Cross starts with the Roebuck Hotel on the old A30. In 1986 this was purchased by Forte's Little ChefHistory, who provided a new petrol station. 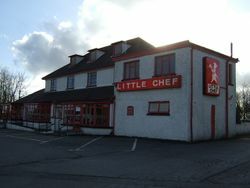 The Little Chef Lodge opened shortly after, which became Travelodge. This gained a Burger King but the Little Chef was forced to close in January 2018 when new owners Euro Garages lost the rights to the name, but became EG Diner. 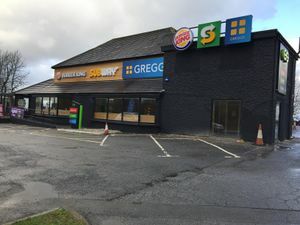 Both this and the Burger King then closed at the end of September 2018 and reopened in December 2018 with a refurbished Burger King alongside Greggs and Subway. The Shell filling station underwent a major refurbishment from August to November 2014 and reopened with a large Deli2go counter. The filling station was then refurbished again in January 2018 and reopened with a Little Waitrose store.